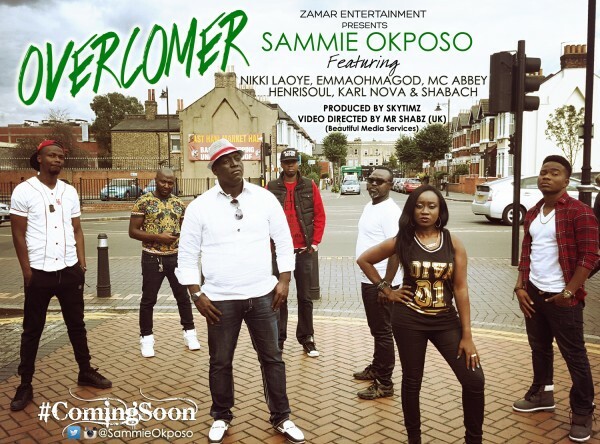 Award winning Gospel singer and producer, Sammie Okposo, has released a video "Overcomer". This video features top Nigerian/UK Artists & Comedians namely Nikki Laoye, MC Abbey, EmmahOhMaGod, Henrisoul, Karl Nova and Shabach. Produced by fast rising producer, SkyTimz, OverComer is a groovy, hillarous yet inspiring song - an expression of the confidence and swag of a Believer, based on the promises of God, in the face of Life's issues and Negativity. The song showcases the unique expressions of each featured artist: Sammie Okposo - The S.W.A.G Boss; Nikki Laoye - The Vivacious Soul Singer and Dancer ; MC Abbey - The Rib-Cracking Professor of Comedy; EmmaOhMaGod - The Comedian,The Actor,The Singer; Henrisoul - The Vibrant Music Whizz; Karl Nova - The London Boy aka UK's Prince of HipHop and Shabach - The Singing Video Director and Music Producer. Together, they creatively sound the bell of warning in a modern Nigerianese depiction of the popular scripture verse - "The Lord is my Light and Salvation, Whom Shall I Fear, The Lord is the strength of My life, Of Whom Shall I be afraid? OverComer is one of the singles from the upcoming studio album, S.W.A.G (Saved With Amazing Grace) to be released later this year.